Apple’s iPhoto has always been a rich and satisfying consumer-level photo-editing program with lots of neat extras thrown in, such as the ability to create books, calendars, cards, and slideshows. The newly-announced iPhoto ’09 takes advantage of emerging photographic technologies that camera companies are now building into their hardware—face recognition and geotagging, to name two. The new iPhoto also taps into the relatively new, explosive phenomena of social networking. It all adds up to a supremely relevant and interesting upgrade that even veteran users should be able to discover new ways to enjoy. 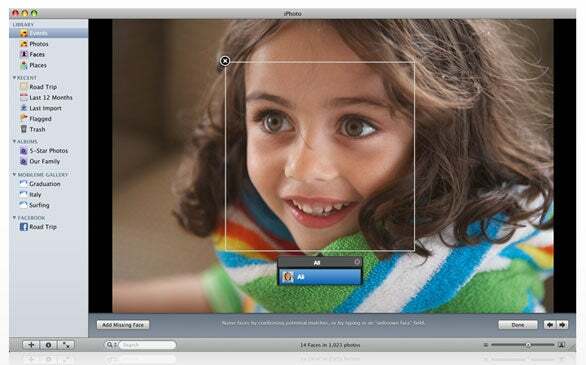 As detailed in this week’s Macworld Expo keynote, iPhoto ’09 has two high-profile new features: Faces and Places. These let you organize your photo collection by the people in them or by the locations where they were shot. We’ll explore what we’ve learned about those two additions, along with other iPhoto ’09 enhancements such as slideshow themes, social networking, book maps, and more, enhance already popular iPhoto features. 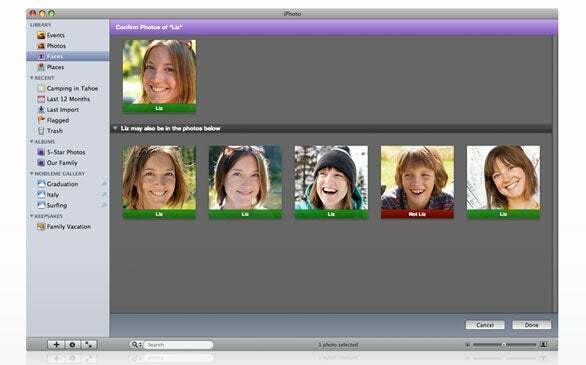 Using face-detection and -recognition technology, iPhoto can now identify faces in your photos and match them with the faces of people in your albums so that you could, for example, see all the photos with your brother in them, regardless of when or where they were taken. It’s easy to pair a name with a face: Just click on the Name button at the bottom of the iPhoto window. The program pinpoints each face in a photo by drawing a square around it and letting you type in the name of the person. Moving through the rest of the album, if iPhoto recognizes a face you’ve already named, it will suggest that name. If the name is correct, just click on the check mark. Click on the Name button at the bottom of the iPhoto window, and the program draws a square around each face in the image. You can either enter a name, or see if iPhoto recognizes the face. Apple says that you’ll only need to name a few photos of the same person before iPhoto will recognize other photos of that person. We’ll determine if that is, in fact, the case, once iPhoto becomes available for more extensive testing. For instance, it will be interesting to see how the Faces feature handles photos of kids, as they age from year to year. Of course, you can name as many people in your albums as you want. And you can create smart albums of that person, which will dynamically update whenever you add new shots containing that person. The new Faces view in iPhoto resembles an old-fashioned corkboard with snapshots of all the people you’ve named. Double-clicking on any snapshot reveals both the pictures of people with confirmed identities, plus all the other images in your library that iPhoto recognizes that person in. The top of the interface shows the photos that you’ve confirmed. The bottom shows iPhoto’s suggested face matches in your other photos. For each snapshot, click on the Confirm Name button at the bottom of the window to verify that iPhoto is correct. You can batch select to confirm names too, or you can reject iPhoto’s guesses. The Faces view puts images you’ve already confirmed at the top of the screen and shows suggested matches at the bottom. If faces are turned to the side or otherwise obscured, and iPhoto does not recognize that there’s a face in the picture, a button called Add Missing Face will still allow you to name it. If you’re traveling on vacation, or just shooting close to home, iPhoto’s new Places feature is designed to let you accurately locate where your shots were taken. If you have a GPS-enabled camera or are snapping shots with your iPhone 3G, the feature works seamlessly without any input from you. Click on the Info button on each photo, and the image flips over to reveal both the location and a map with a pin marking the spot. You can view the map in terrain, satellite, or hybrid view. You can view this information for a single image or for a group of images that make up an event. Clicking on the Info button on an image flips it over to reveal where it was taken. If you have an older camera, a first-generation iPhone, or images in your library that are not geo-tagged, you’re not locked out of Places. All you need to do is click on the Info button on a photo or event, and type in the location information such as the name of a place or an address. iPhoto then taps into a huge Google database of named locations—often places where you’ve shot pictures will automatically appear in a list as you type. You can also manually add a place to the list. An Assign To Event button lets you attach any location you want to your photos. Once you’ve assigned locations, you can search for your photos in the Places view (which shows you a large interactive map), view photos by picking a spot pinpointed on the map, or type a location in the search box. A column browser view lets you narrow down your search for specific photos by letting you choose a country, state, or point of interest from a list. In the Places view of iPhoto ’09, click on a pinpoint to see all the photos taken in that spot. 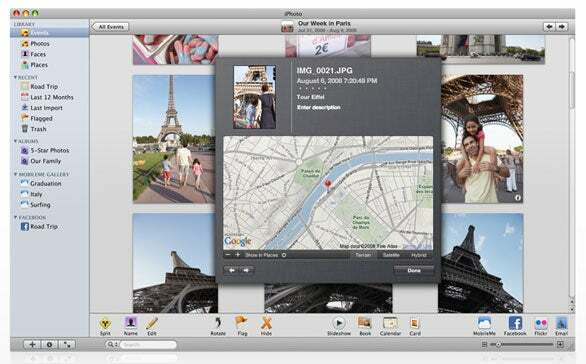 Previous versions of iPhoto allowed you to create custom calendars, books, and cards. That’s also the case with iPhoto ’09, but now you can take advantage of the program’s new location-mapping capability to add maps to a custom-made book, say, for tracing the route of a vacation. While the current version of iPhoto is great at generating slideshows, iPhoto ’09 looks to enhance slideshows with themes. The face detection technology ensures that faces are properly centered in slideshows. When you’re finished constructing a custom slideshow project—which gives you numerous ways to tweak titles, music, speed, and other visual elements—you can export it as a movie, send it to iTunes, and sync it to your iPod, iPhone, or Apple TV. Convenient new Facebook and Flickr buttons give you a one-click way to share photos or slideshows on your social networks. Photos containing people you named with the Faces feature will get tagged automatically on Facebook. You can specify that your friends on Facebook are notified whenever their tagged images are posted in your Facebook albums. This feature even allows friends to tag unidentified people in your photos; when you sync back to iPhoto, those newly-entered names appear in your library, too. iPhoto ’09 introduces several photo-editing improvements as well, such as Smart Saturation, a control that enhances colors without distorting skin tones. Face detection capabilities also power the auto red-eye function, which automatically removes red eye from images. And a new definition slider is designed to enhance the clarity and detail of photos. Finally, a new Detect Edges feature in the Retouch brush will leave you with cleaner details in your touched-up images. iPhoto ’09 is part of the new iLife ’09 suite, due later this month. If you buy a new Mac, the software comes pre-installed. If you recently bought a new Mac, you can upgrade for $10. The suite costs $79 for everyone else. Macworld will have a full review of iPhoto ’09 once the iLife suite arrives.